My mac shutdown through loss of power and now PyCharm settings are gone - all the preferences and run configurations. Is there a way of restoring these configurations as can't work out how to get it running again! You can clean this folder to fix the problem. Where I am stuck now is in running a django module. 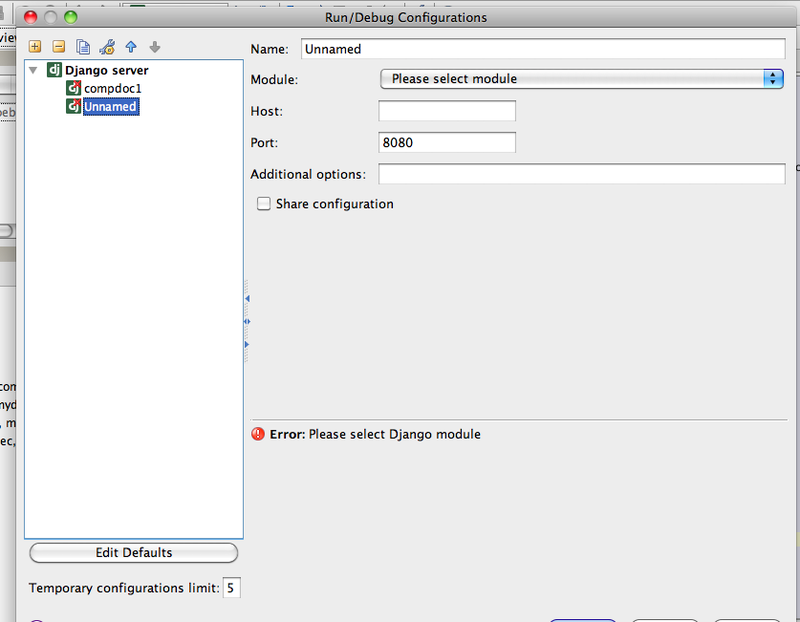 The configuration has been lost seemingly and there is nothing in the modules dropdown to select. Looking for an earlier version to give me a clue as to what should be in here with no luck. Screenshot attached. Finally back working again. Deleted application and preferences in library and re-installed. In Preferences/Python Interpreter set the interpreter to /Library/Frameworks/Python.framework/Versions/2.5/Python and that was enough to get going again. I got bit by the same issue twice this week. I eventually found that "touch"ing the files in the ".idea" folder in my project directory fixed the issue. I also had to "touch" some of the source files in my project. I think PyCharm's internal cache ends up corrupted from the abrupt shutdown. Touching the files forces Python to ignore the (older and corrupted) version in its cache. I just noticed the File/InvalidateCaches menu option today. Maybe that would fix the issue also?